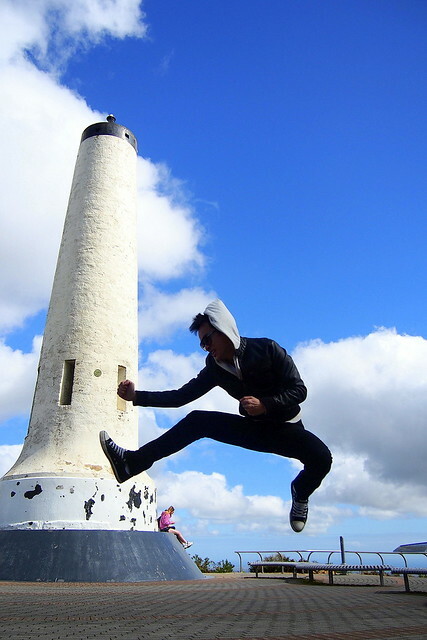 I’ve been to Australia three times, and every trip, I find something new to love. 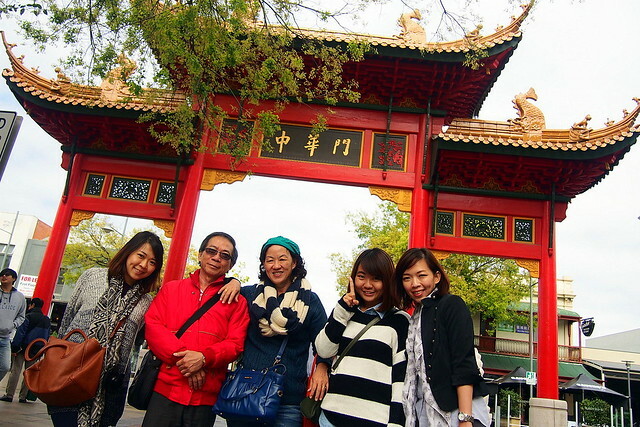 My most recent trip to Australia was a family trip organised by me and my sisters. It was one of the best trips ever, according to my parents who enjoyed themselves very much. 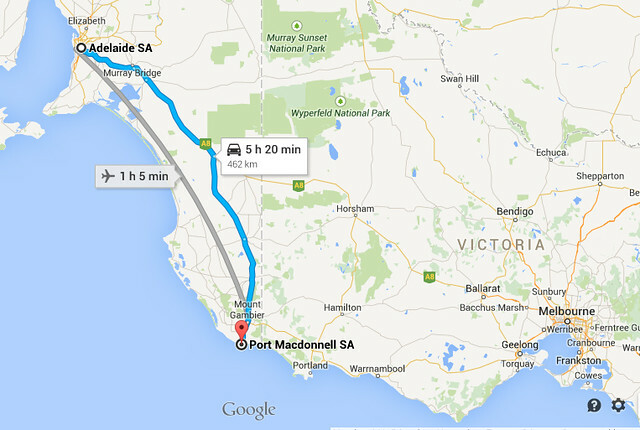 We did a self-drive trip from Adelaide to Melbourne, crossing the state boundaries from South Australia to Victoria. Why Adelaide? South Australia actually has a lot more going for it than we think. 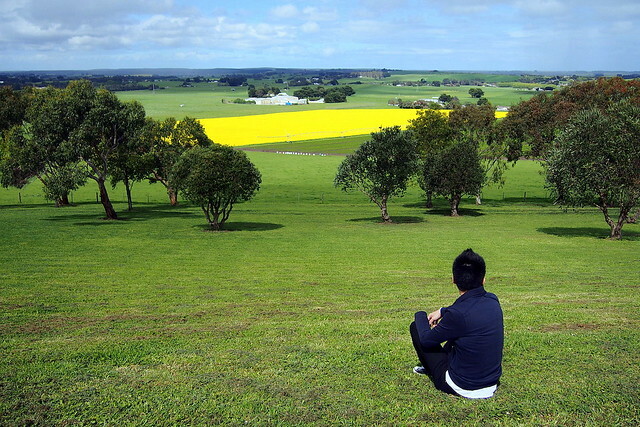 There are just so much to see and to do in South Australia! Apart from Adelaide and Adelaide Hills; we also hope to meet native wildlife on Kangaroo Island, swim with sea lions on the Eyre Peninsula or drink the world’s best wine in the Barossa, Clare Valley and McLaren Vale on the Fleurieu Peninsula. 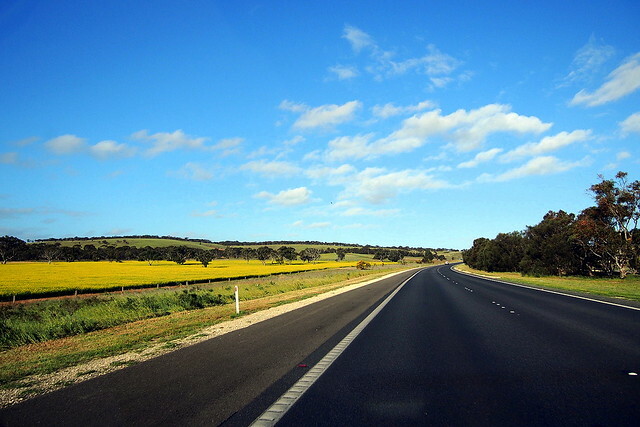 The best way to explore South Australia is on a driving holiday. 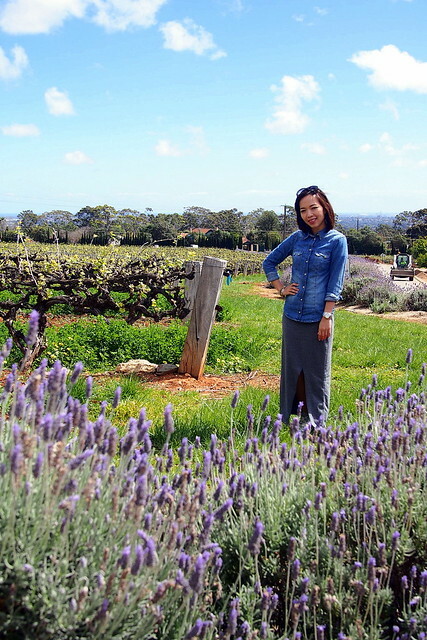 Together with my family of 6, we rented an 8 seater car and we got to travel at our own pace, visiting places such as Adelaide City, Adelaide Hills, Hahndorf, Mount Gambier and Port Macdonnell. We arrived to Adelaide Airport after a 7-hour plane ride. There is direct daily flight to Adelaide by the way. 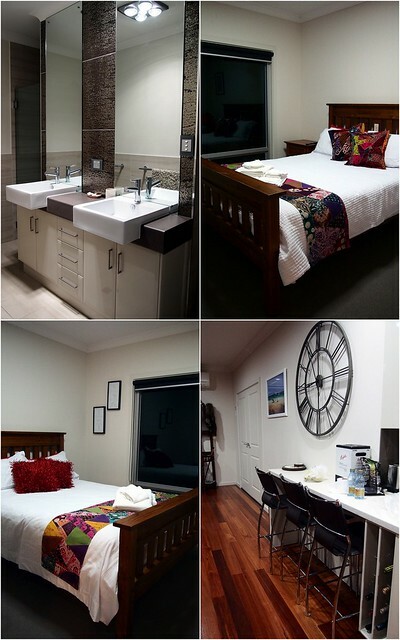 The airport is only seven kilometres from Adelaide city so we reached our apartment – Franklin Central Apartment within 15 minutes by taking a maxi taxi. Adelaide city is a one square mile city centre and the streets are laid out in grids. 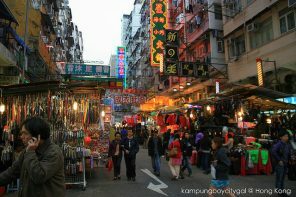 Our apartment is smacked right in the centre of the city so it is very easy for us to explore the city. 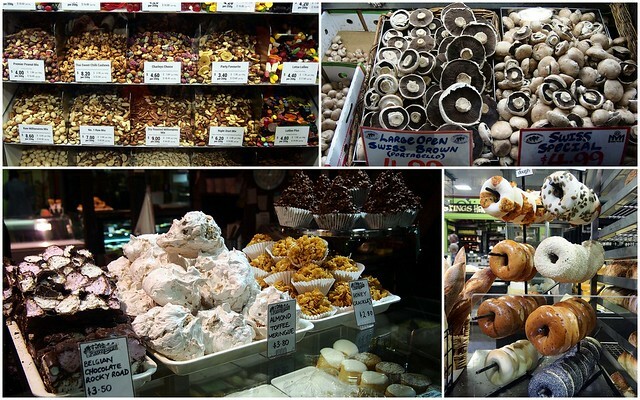 My mum specially requested for a visit to the Adelaide Central Market. 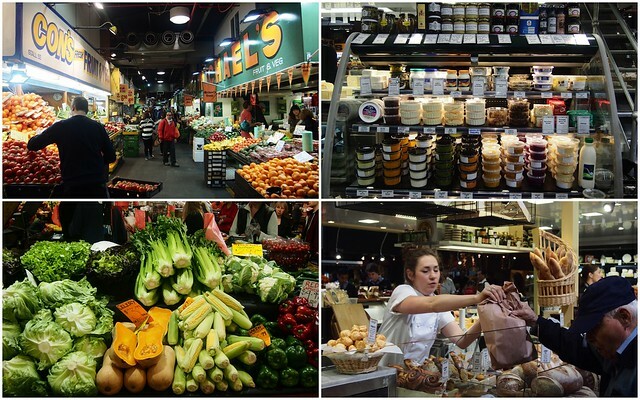 She loves fresh produce of any kinds – fruits and vegetables, meat and poultry, seafood, gourmet cheeses, bakery products, sweets, nuts and health foods. 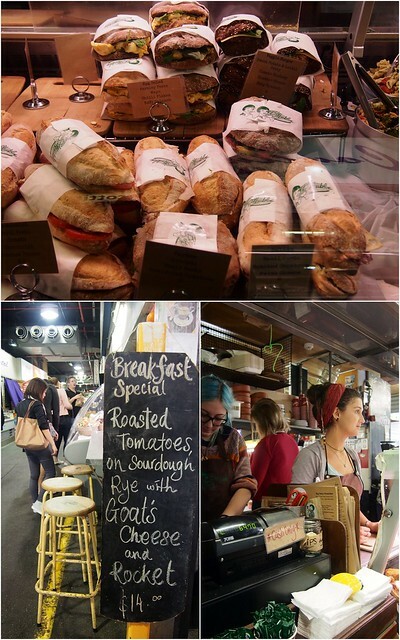 The market was buzzling and lively – a photographer’s paradise and a great place to experience local culture. 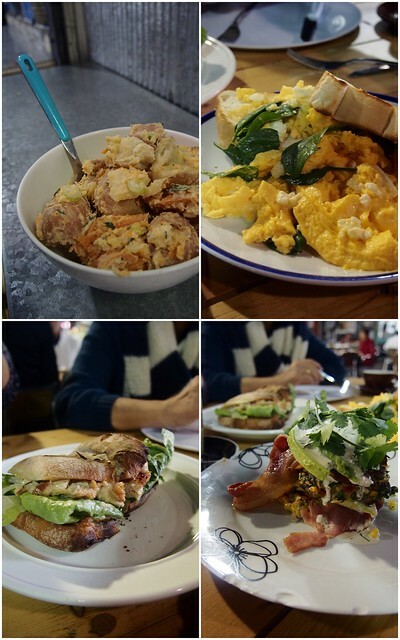 We stopped by for brunch at the Big Table that serves sandwiches, salads and breakfast. They have plenty of seats either at the bar stools or over the walkway in the market. We were really happy with what we ordered, especially the corn fritters with avocado and bacon. The breakfast was good value for money – large servings, fresh and delicious. 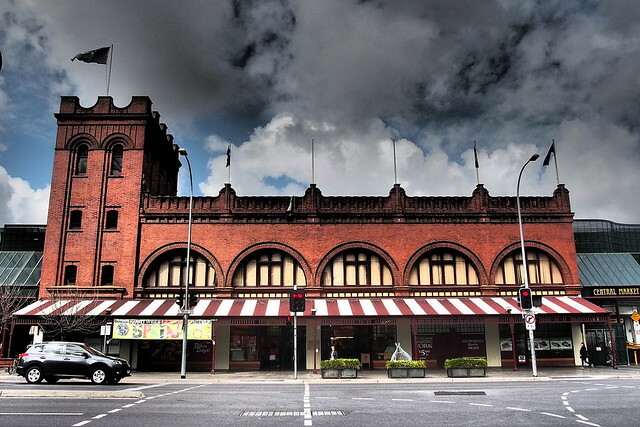 Just behind Adelaide Central Market is the Adelaide Chinatown. The large ‘paifang’ marks the entrance to many Asian restaurants, groceries stores and markets. 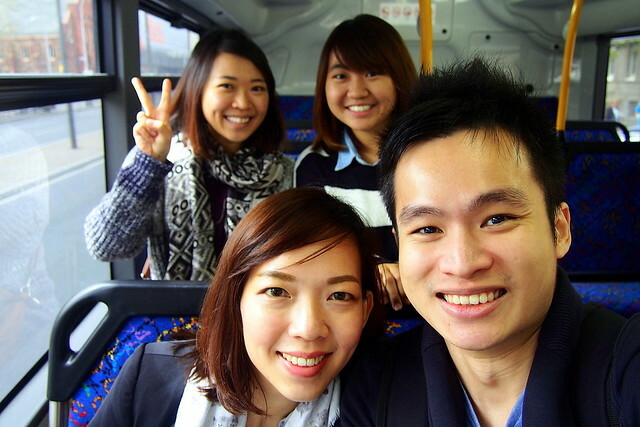 Since we were not driving on the first day, we took advantage of the Free City Connector, which services the City and North Adelaide linking major tourist attractions, key city destinations and facilities. 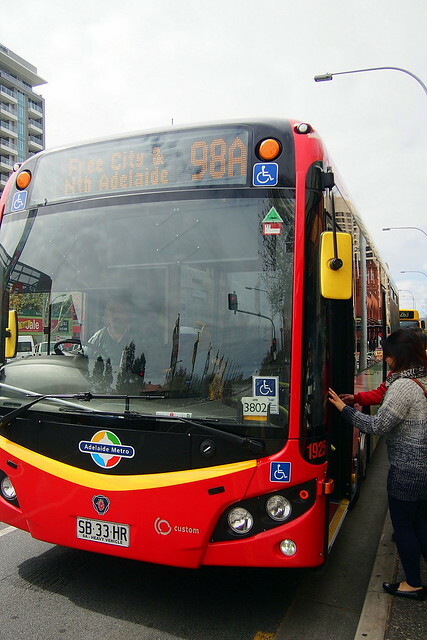 The large loop (98a and 98c) connects North Adelaide and the City, while the small loop (99a and 99c) connects the inner city areas that are not serviced by the tram. Free tram service is also available for everyone’s convenience. For more information on free travel options within Adelaide City, North Adelaide and Jetty Road, Glenelg, please click here. We alighted from the bus and walked a short distance to Adelaide Botanic Garden. 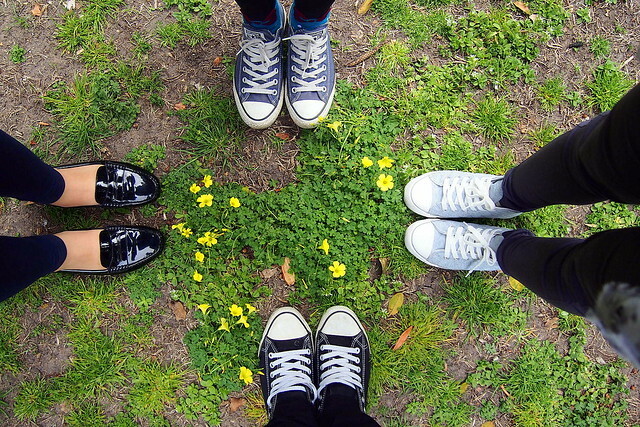 Various flowers bloom in the mild and warm spring weather. 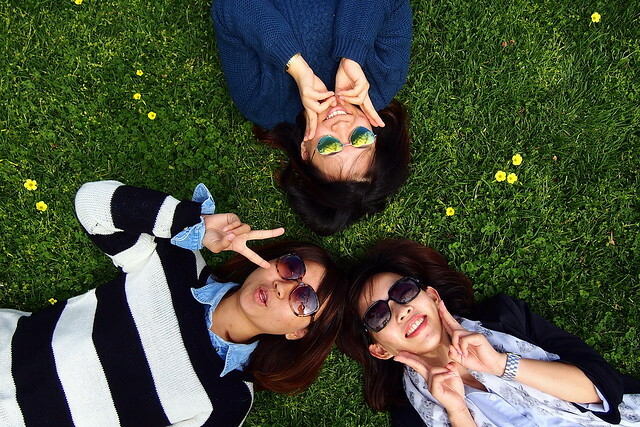 A visit to the Botanic Garden is a great way to enjoy the good weather, flowers and culture. Closing: 5.30pm to 7.00 pm, depending on season. Free Guided Tour: 10:30am daily, except Christmas day and Good Friday. Depart from the Visitor Information Centre in the Schomburgk Pavilion. Please note guided walks are cancelled when the forecast temperature is 36 degrees or above. We enjoyed exploring historic buildings including three striking glasshouses – the Palm House, Bicentennial Conservatory and Amazon Waterlily Pavillion. 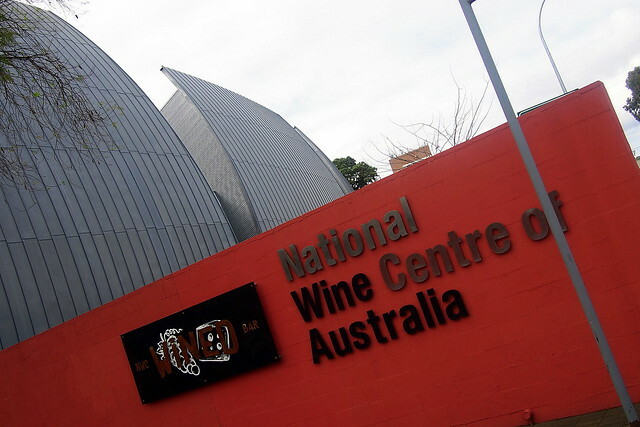 Situated on the edge of Adelaide’s stunning Botanic Gardens is the National Wine Centre of Australia. It showcases the Australian wine industry and boasts Australia’s largest tasting room experience with visitors able to sample 120 different wines thanks to the installation. From Adelaide Botanic Garden, we walked to the North Terrace of Adelaide which is a pleasant place to stroll. The historic plaques along the northern footpath showcase the histories and the people who contributed to the growth of Adelaide. The main area from King William Street to Frome Road passes the major attractions of the State Library, Museum and Art Gallery with offshoots to other places of interest. 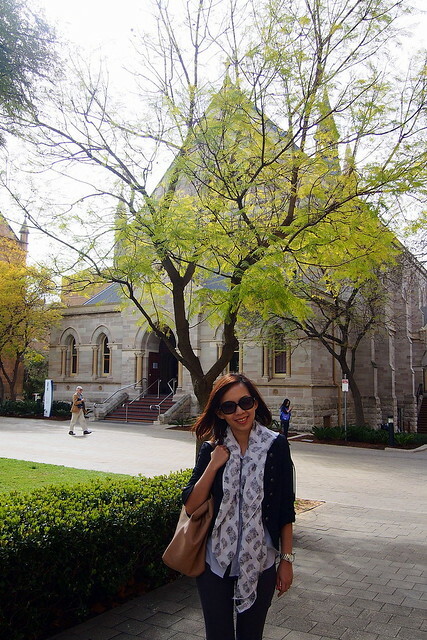 We walked along North Terrace and it is a good introduction to the city of Adelaide. 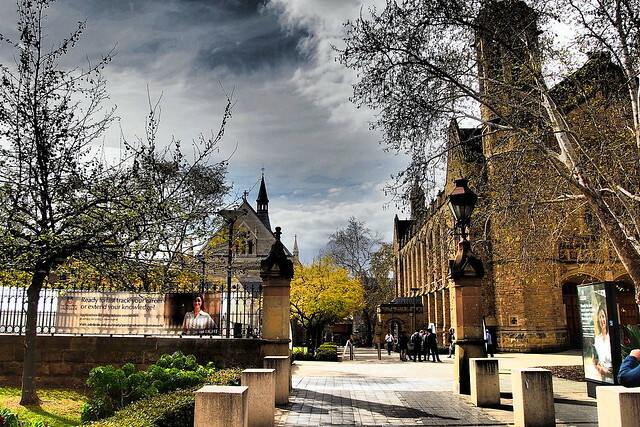 The University of Adelaide’s beautiful campus ground in North Adelaide is made of traditional sand stone buildings. Rundle Mall is the shopping heart of Adelaide so we were tempted to shop up a storm here. 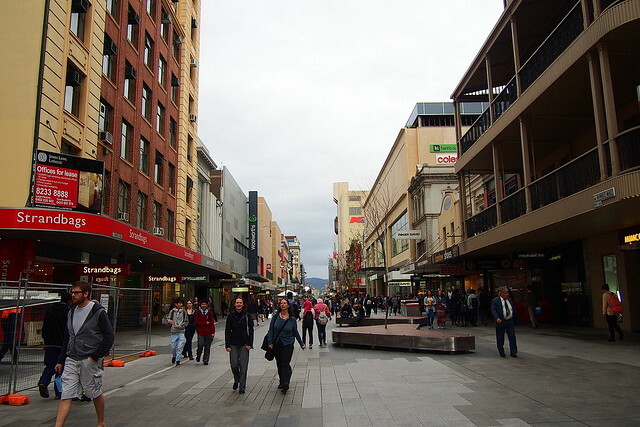 My Adelaide friends told me that one has not really been to Adelaide until he/she takes a stroll down the famous pedestrian mall with more than 600 retail stores and 3 department stores. 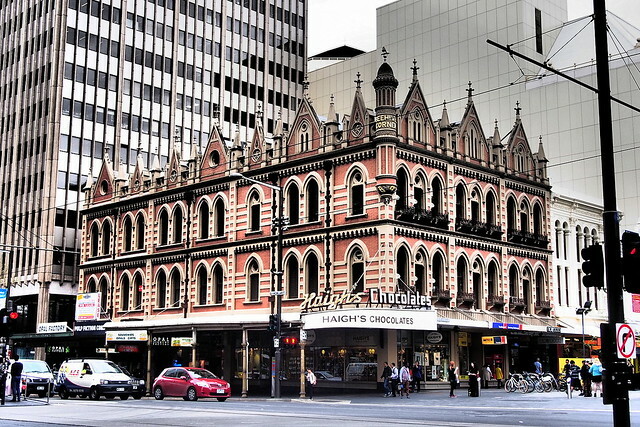 Haigh’s Chocolates is Australia’s oldest family owned chocolate maker and it’s flagship store in Rundle Mall is huge. The chocolate speaks for itself. The truffles were great. I bought some chocolate bars, and they were so smooth and rich. Haigh’s also conducts free tours of its factory on Greenhill Road. Rundle Mall opening hours run from 9am to 7pm Monday to Thursday, 9am to 9pm Friday, 9am to 5pm Saturday and 11am to 5pm Sunday. 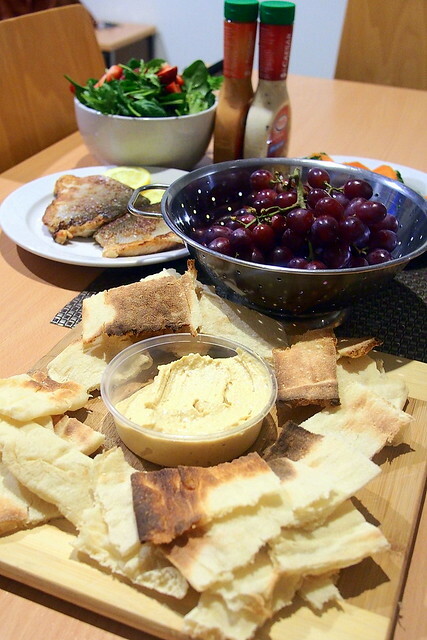 Our dinner was a simple affair, featuring local produce we bought from Adelaide Central Market. It was so fresh and delicious! Rise and shine! We picked up our car from Hertz and off we went on a road trip to explore more of South Australia. Most of the major attractions such as Glenelg, Adelaide Hills, Hahndorf and Mclaren Vale are within 45 minutes travelling radius from the City. 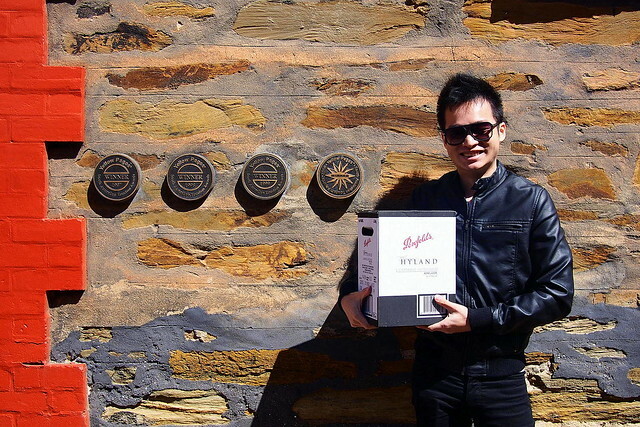 Our first stop was Penfolds Magill Estate nestled in the foothills of Adelaide. 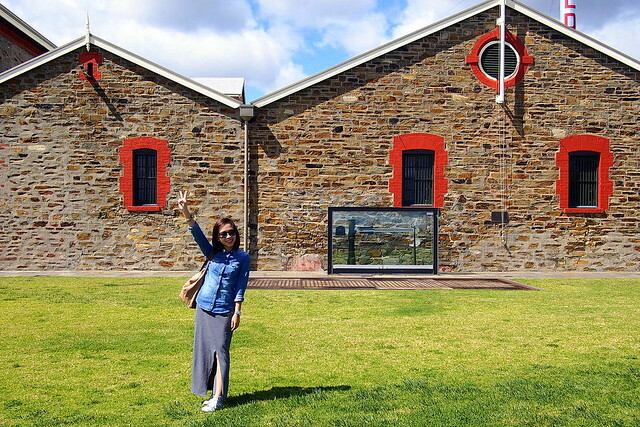 It is the original home to the famous household name Penfolds wines and of Australia’s most prized wine, the famous Grange. We were truly honoured to be able to have a glimpse of the vineyard where the Grange story started. The heritage-listed bluestone cellars and Still House, as well as Grange cottage – the original home of Dr Christopher and Mary Penfold was stunning. We even bought home some wines from the cellar. 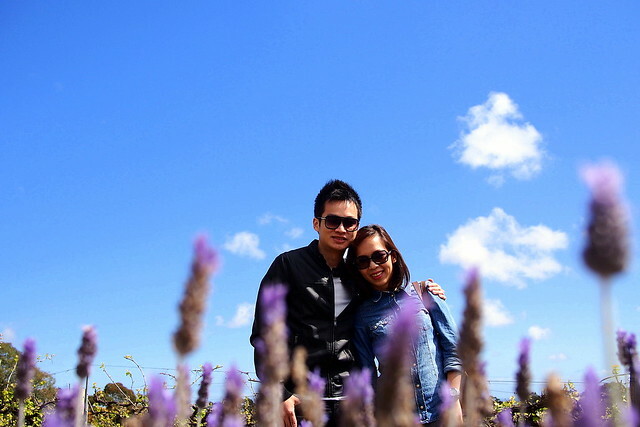 The vineyard, blue sky and lavender farm is truly a beautiful scene. However, we did not have enough time to enjoy a multi-course degustation meal with complementing wines, including grange 2014 in the famous Magill Estate restaurant. Well, there’s always next time! If you are interested in touring the place, tour and tasting is $15 for the heritage tour and there are others with cheese and the top notch Grange tour. 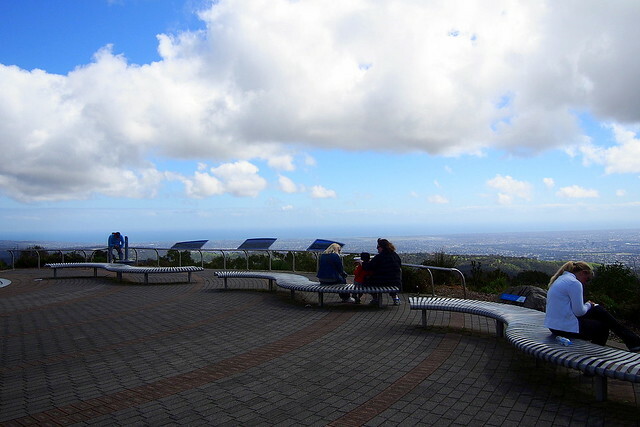 Just barely 30 minutes drive from Adelaide, the Adelaide Hill is a must see attraction. 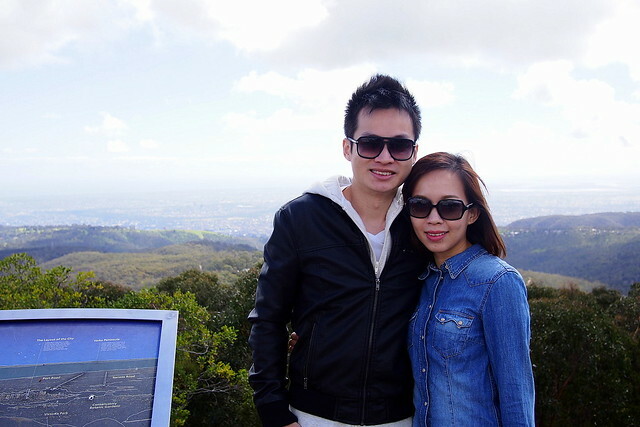 We had a very nice scenic drive to Mount Lofty Summit as soon as we left Penfolds Magill Estate. It is a great location to get a glimpse of Birds Eye view of Adelaide, with visibility extending as far as Kangaroo Island on clear days. The views were so magnificent and lovely and we got to see the city, the sea and the mountainous areas. We wished we had time to explore some of the bush walks, as well as the award-winning Cleland Wildlife Park. However, we were grateful because we actually saw some koalas while we walked around the summit. Direction: If you’re travelling by car, head up Glen Osmond Road to the South Eastern Freeway, take the Crafers turn off and head up Mount Lofty Summit Road, travelling past the Mount Lofty Botanic Gardens, until you reach the Summit. 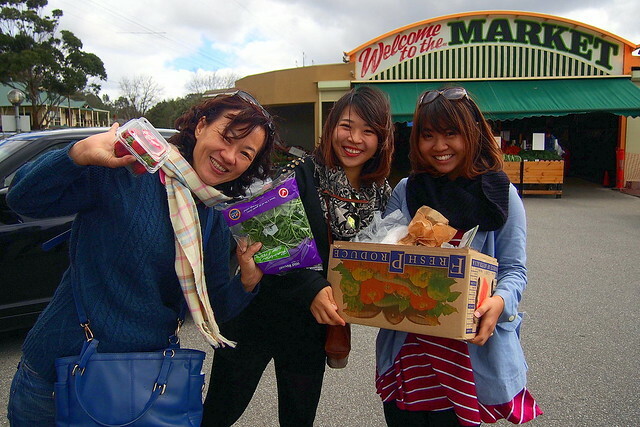 We left Mount Lofty Summit and one of the activities that we really enjoyed on a road trip is buying fresh-fruit and vegetables from a roadside stall. This little stall is located right outside the Hahndorf town. 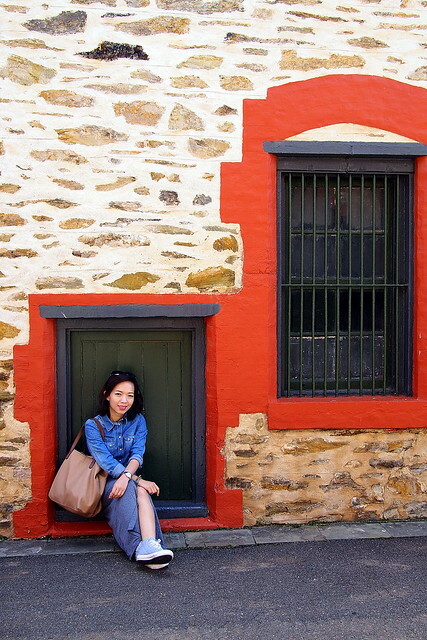 We really looked forward to explore Hahndorf, Australia’s oldest surviving German settlement. There is still a strong German flavour in Hahndorf, most evident in the small goods outlets selling vintage goods and knick knacks, as well as German bakeries that line the bustling main street. 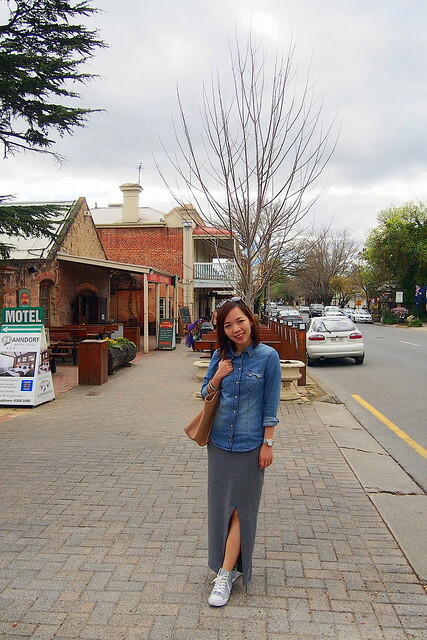 A visit to Hahndorf is not complete without indulging in some authentic German food. 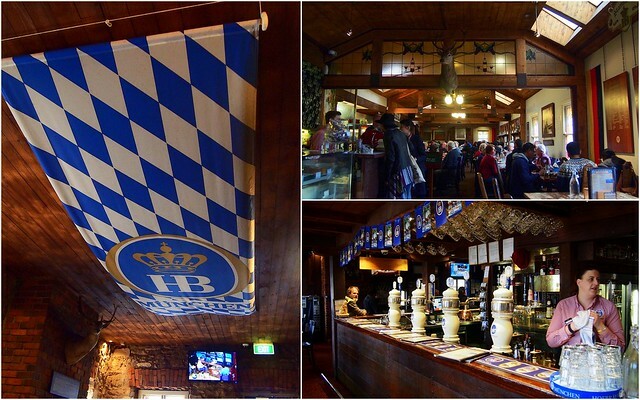 We had one of the best German meals of our lives in Hahndorf Inn. 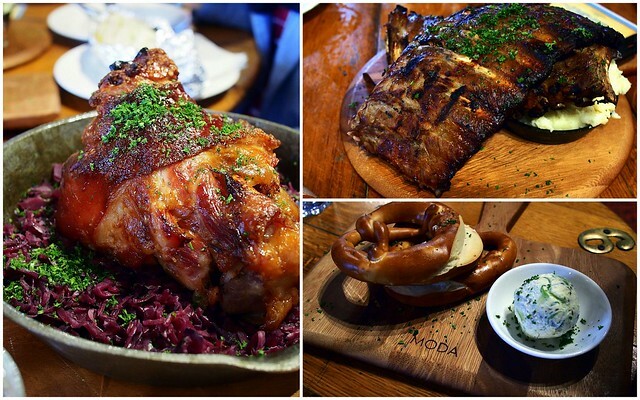 The pork knuckle and ribs came in huge portions so remember to bring your appetite! This is a very busy place; so don’t forget to book if you are going on a weekend. There’s no better way to explore Australia’s beauty than on the road. 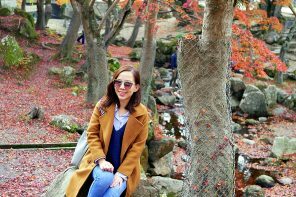 The lush countryside and beautiful farms were so picture perfect! 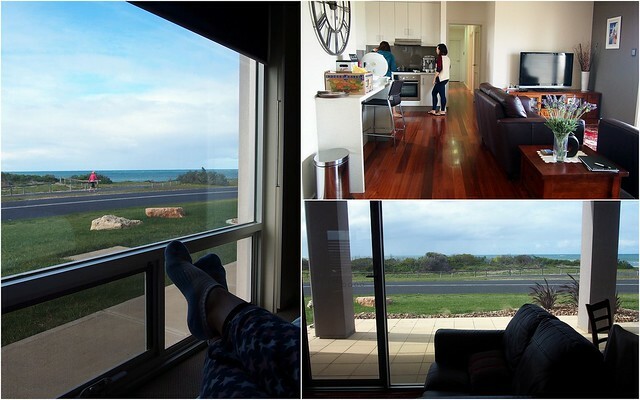 We were staying put in this beautiful beachfront house for our second night in South Australia. This beautiful property was chosen because it offers sea view from every room. 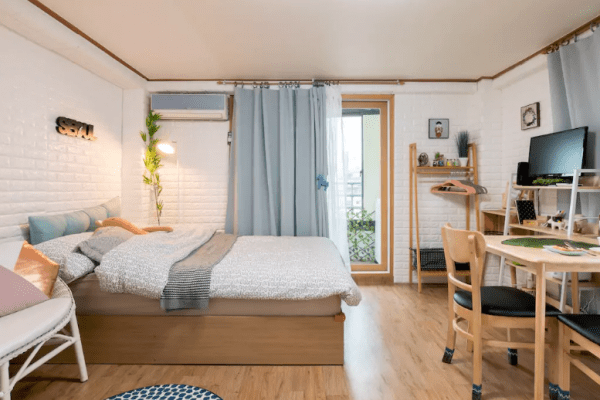 More information on the property here – https://www.airbnb.com.au/rooms/2882725 Remember to use this code wchin1 for RM 91 discount once you book. Good morning! Waking up to this beautiful ocean view is such a bliss! The property is directly opposite a beautiful swimming beach. After breakfast, we enjoyed long walks on the beach and a bike ride on the cycle path. 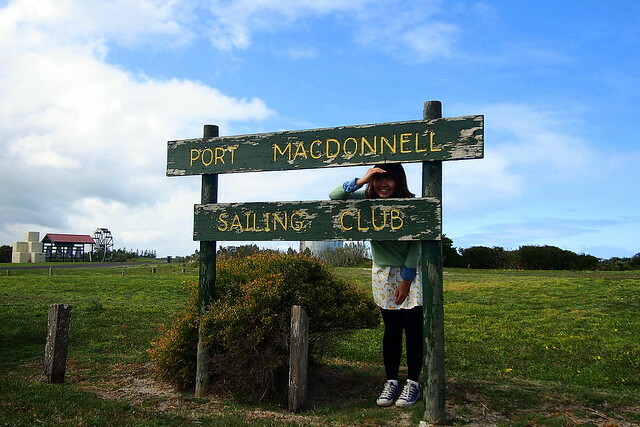 Port MacDonnell is also only a short drive to many of the Limestone Coasts attractions including the world famous Blue Lake. 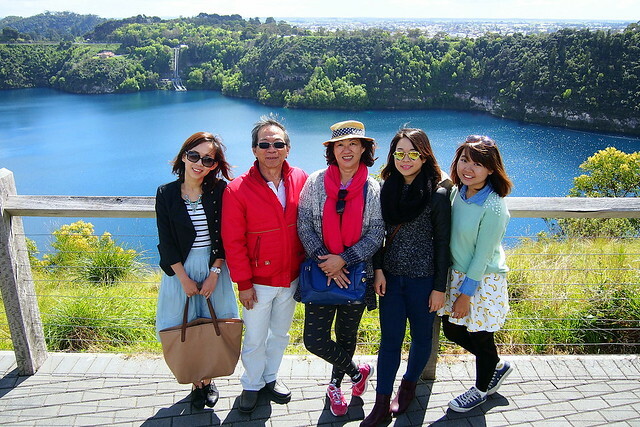 We were marvelled by the beauty of the Blue Lake at Mount Gambier, which in November to January changes from steel-grey to a brilliant turquoise blue. We were there on September, and the lake welcomed us in this beautiful blue hue. Blue Lake is a crater lake in an extinct volcano in Mt. Gambier. One can also join the tours down near the surface of Blue Lake. It is operated by the Reception Centre. 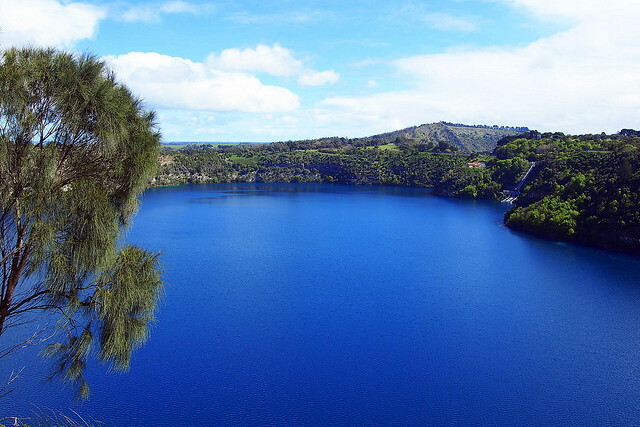 The 3.6 km road and walking track around the circumference of the lake provide access to many viewing points, the most popular being the tunnel beneath the road between the Blue Lake and the Leg of Mutton Lake. 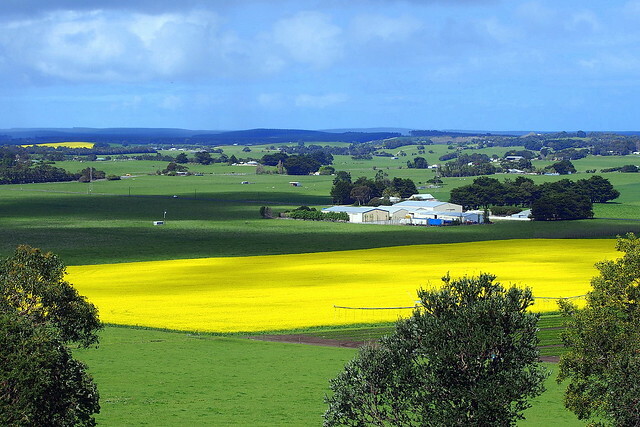 In early spring one can witness an amazing “Golden Sea” of canola flower in many places across Australia. We walked around the Blue Lake and these canola plants brighten a field on the outskirts of Mount Gambier. There’s nothing more photogenic as a beautiful yellow field as your backdrop. My family and I had the opportunity to visit Metro Café & Bakery during lunch hour. Rated as the No.1 restaurant in tripadvisor, we were not disappointed. The place was crowded and I could easily guess its popularity. 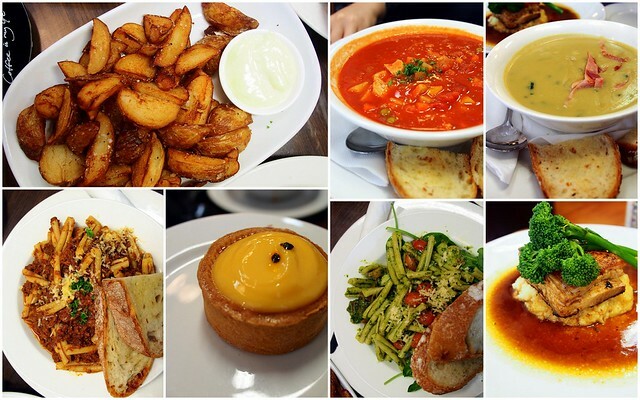 Almost everything that we ordered was delicious, especially the potato soup, roasted pork belly and lemon tart. 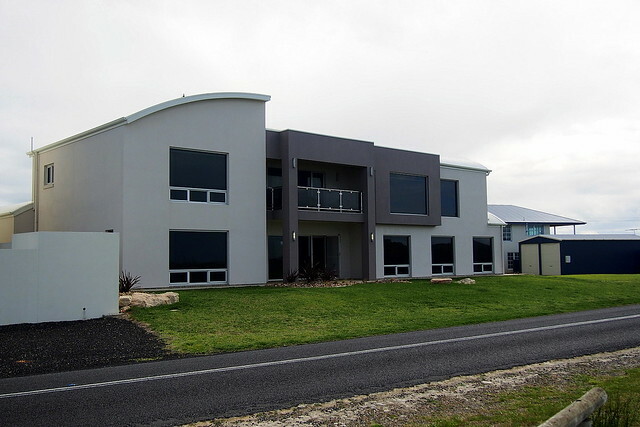 Address: 13 Commercial Street East, Mount Gambier, South Australia, Australia. 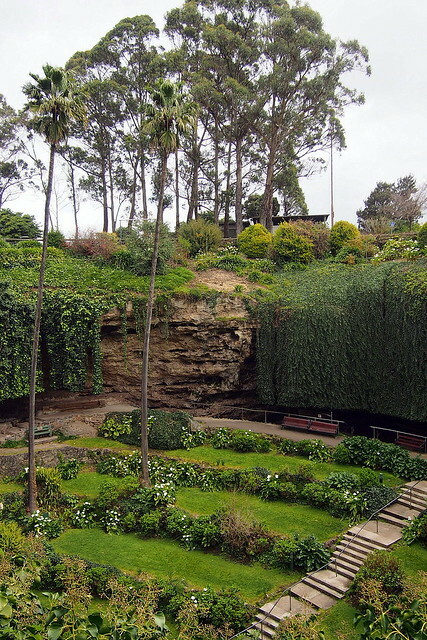 Within walking distance from our lunch venue is the Cave Garden. I couldn’t believe this sinkhole is in the middle of town. 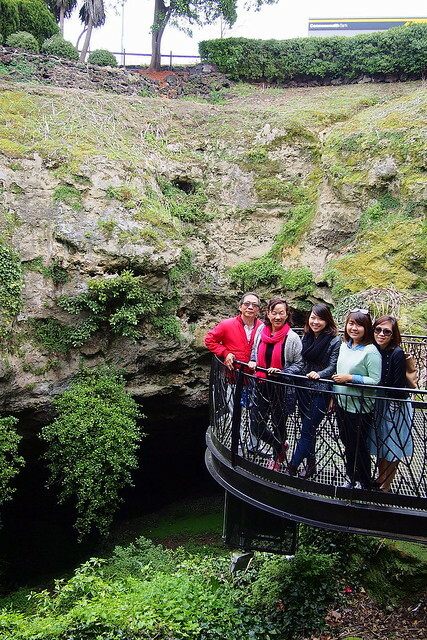 It is not every day we get to walk down into a cave garden in the middle of a town and take pictures – what a great experience! 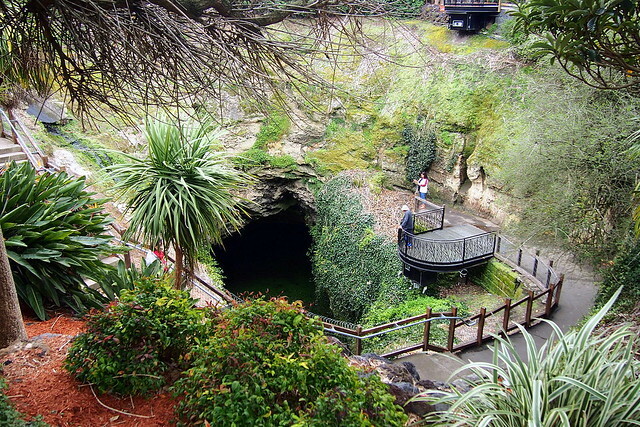 We also visited the Umpherston Sinkhole. 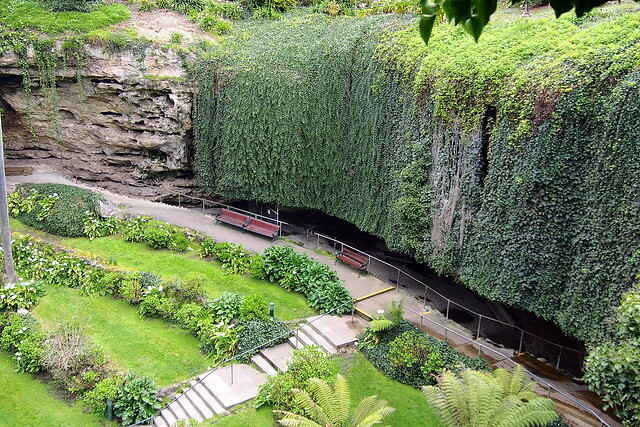 Once a cave formed through dissolution of the limestone, this sinkhole was created when the top of the chamber fell to the floor of the cave, creating the perfect environment for its “sunken garden”. The garden is beautifully maintained and looks beautiful from above. We were told that the sinkhole is open at all times, from dusk each evening the area comes alive with possums as they venture into the floodlit gardens to feed. 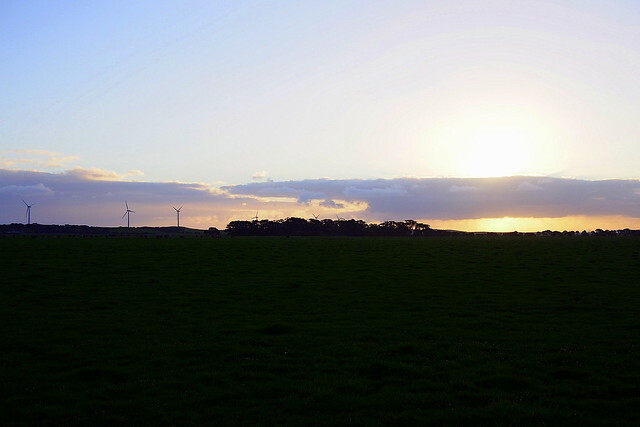 This beautiful sunset photo marks the end of our South Australia trip. 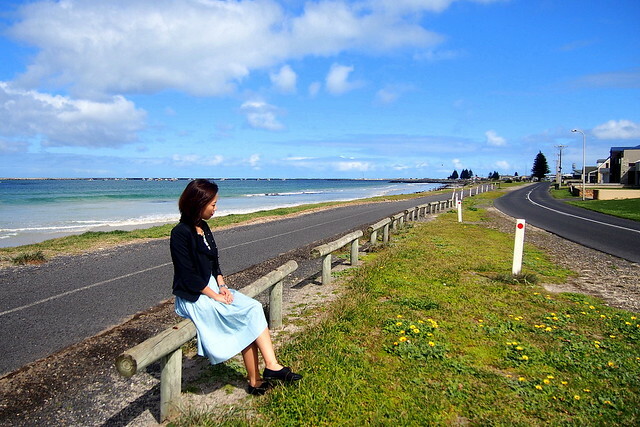 With a heavy heart, we continued our drive to Warrnambool and the Great Ocean Road before reaching Melbourne. I hope that through our post, you get to know a little bit more about South Australia, an underrated region in Australia. 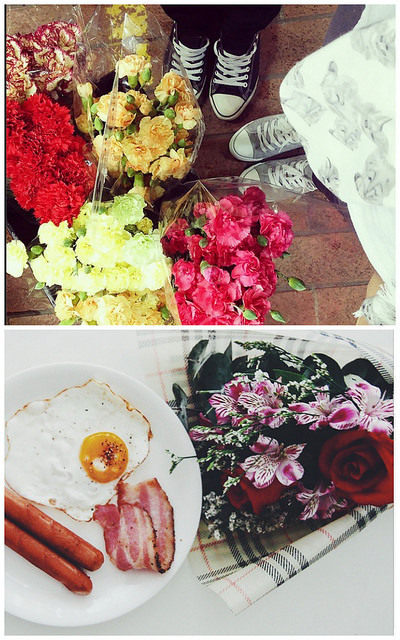 The best thing is, we spent so little throughout our trip. Most of the attractions are free of admission charges, and food and lodging is good value for money. Having said that, we were only scraping the surface because 3 full days in this beautiful region is definitely not enough. We hope to return here very, very soon! 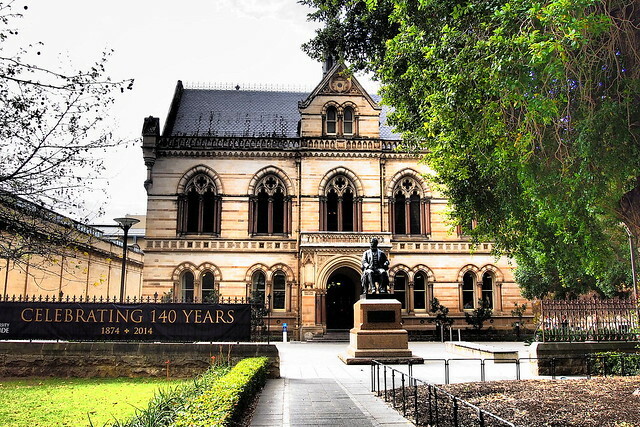 For more information, visit http://www.southaustralia.com. 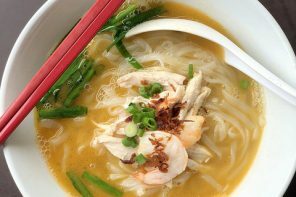 Previous articleBoracay Travel Guide: Must See, Must Eat & Must Do!